Hordes of zombies push up through loose topsoil and shamble through the cities of the world. The gods of Norse mythology descend on Earth for the time-ending battle of Ragnarök. A secret society of reptilian aliens launches its endgame after controlling civilization since time immemorial. And if that weren’t enough, your dishwasher is planning your imminent demise. Throughout the four books of The End of the World roleplaying game series, you’ve had the chance to experience the chaos and tumult of the apocalypse, and even advance into the new world order ushered in by the post-apocalypse. You’ve played as yourself, standing in your own worn sneakers on the battered ruins of humanity. You’ve fought creatures that you never could have imagined, and you’ve died—over and over and over again. But fortunately, it’s all in good fun. Today, Tim Cox, the writer behind the scenarios of The End of the World series, looks back on the four books and shares some of his experiences with crafting this unique approach to the roleplaying genre. 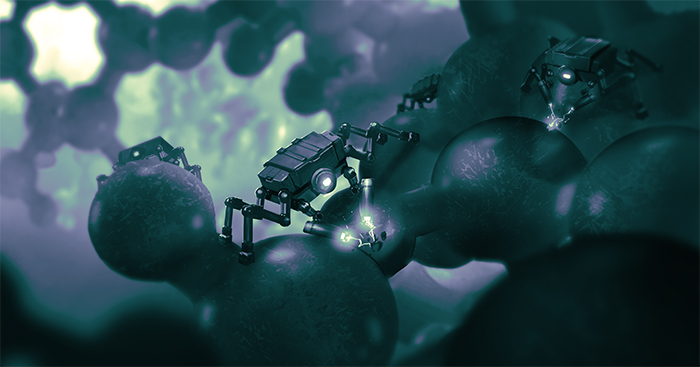 The final book of the The End of the World tetralogy—Revolt of the Machines—will soon be available from your local game shop or online (assuming the Internet is still taking direction from mere humans). Being the writer of the scenarios and general non-rules-stuff for the series, I’m understandably excited for the release. There’s a sense of completion in the release of the final book—but, of course, one of the beautiful things about roleplaying games is that the finished book is only the beginning. The real stories are created around the table or by the half-formed ideas in a Game Master’s mind as he thumbs through the pages. Based on El Fin del Mundo, an RPG line originally created by Álvaro Loman and José M. Rey for Edge Studios, The End of the World still had to be adapted for American audiences. And that’s just one of the reasons working on The End of the World was considerably different from the other projects that I’ve done with Fantasy Flight Games. The scenarios in El Fin del Mundo provided great starting points for developing the scenarios in The End of the World, but because we weren’t simply translating the existing game into English, there was plenty of room to play with the ideas and put a new spin on things. Some scenarios ended up scarcely recognizable when compared to their predecessors! 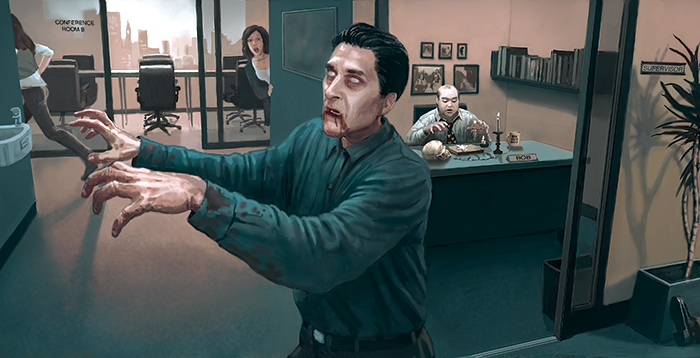 Another unique factor that played a role in developing the scenarios for The End of the World was the artwork. 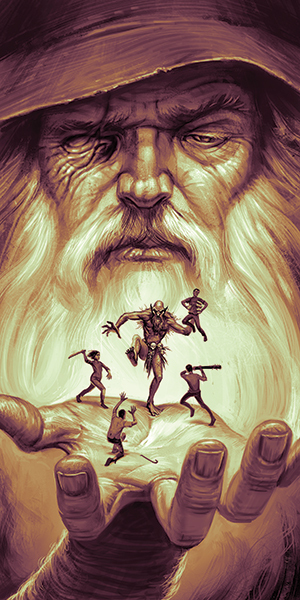 With many other RPG books, the concepts for the art are primarily determined in the early stages of development to reflect the developing text and content. However, a very large chunk of the excellent artwork for The End of the World comes from El Fin del Mundo, which meant that the existing art was something I was able to keep in mind throughout the writing process. With such great art, I quickly found that this was a source of inspiration rather than restriction. Any project involves a certain amount of research, and for The End of the World, this included watching everything from classic zombie films to the cheesiest of disaster movies. In keeping with my quest to present truly horrific situations with an element of dark comic relief, these movies ranged from the depressing to the hilarious (whether intentionally or not). Working on The End of the World was a great experience. I’m quite proud of this series, and I hope players and GMs have as much fun with it as I did. As always, I’m immensely grateful to the graphic designers and artists who distract from my words with a truly professional product. And I owe a big thanks to Tim Flanders, Andy Fischer, and everyone else at Fantasy Flight Games for letting me destroy the world—twenty different ways. If anyone asks, they’re all accomplices. The final book in The End of the World series, Revolt of the Machines, will be available at your local retailer in just a few weeks! Reserve your copy today, and complete your set of apocalyptic RPGs with Zombie Apocalypse, Wrath of the Gods, and Alien Invasion. 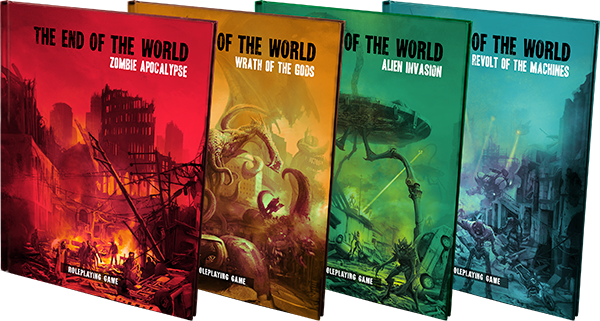 The End of the World is a roleplaying game line consisting of four books: Zombie Apocalypse, Wrath of the Gods, Alien Invasion, and Rise of the Machines. Every game challenges you to play as yourself in the midst of the world's ending. You must face unfamiliar threats in familiar places to survive even another day in the tumult of the apocalypse. Each book in The End of the World line contains five unique scenarios, each offering a different take on the book's titular theme.